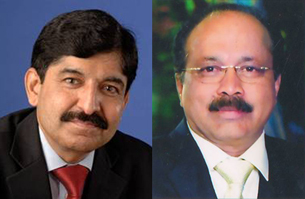 Mangaluru, Feb 22, 2016: Mangaluru based premier private sector Bank, The Karnataka Bank Ltd has appointed Ullal Ravindra Bhat, Mumbai and Keshav Krishnarao Desai, Hubballi as Additional Directors under Section 161 of the Companies Act, 2013. The above appointment has been made at the Board meeting held on 19th February, 2016. Ullal Ravindra Bhat, (U R Bhat) an Investment Advisor, Mumbai, holds M. Sc from IIT, Kanpur and also a fellow of The Chartered Institute of Bankers, London besides holding Diploma in Financial Studies (Chartered Institute of Bankers, London). He is one of the India’s well known investment advisors and has been managing institutional money for more than two decades. He is presently the Director of Dalton Capital Advisors (India) Pvt Ltd, an investment advisory company of Dalton Group, London. He is a respected commentator in the electronic and print media and has been writing well-regarded columns in the financial press for the last more than two decades. He has been closely involved in formulating policies for benchmark indices for the Stock Exchange, Mumbai as a long standing member of its Index Committee. He has also been a member of the Corporate Governance Committee of the Indian Merchants Chamber. He serves as an Independent Director on the Boards of several Companies. He was also on the Board of Directors of the Bank during the period 28.01.2006 to 27.01.2014. Keshav Krishnarao Desai, holds BE (Mech) graduation. He has been into the automobile business for the past 32 years. Presently he is the managing partner of Desai Group of concerns established in the year 1939 having its head office at Hubli and other offices at all the major places of North Karnataka region namely-Gadag, Haveri, Ranebennur, Koppal, Sindhanur ,Raichur, Kustagi, Vijayapur and Bagalkot . The group has dealerships for the products of M/s TAFE Limited and M/s FORCE MOTORS Limited. He is also into real estate business of constructing residential/ commercial complexes for the last 25 years. He is the managing trustee of Shri Bindurao Desai Trust which owns Geeta Mandir, in Hubli. He is the trustee of Lokshikshana Trust, publisher of the daily Kannada Newspaper Samyukta Karnataka, Karmaveera and Kasturi.